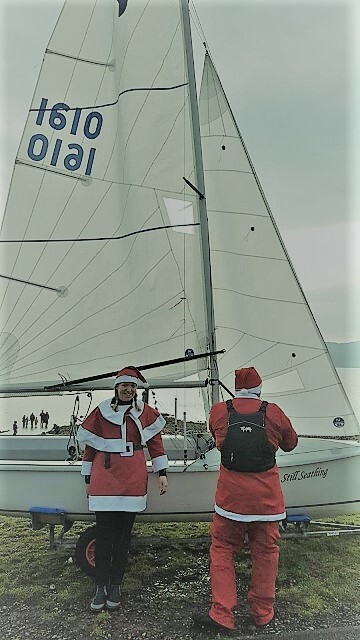 Our main two UK fleets cleaned up in their respective off season events, with Paul Barnett and Stewart Murdoch finishing 1st and 2nd in the Boxing Day race on the Tay, and Paul Gray winning both the Maylandsea Winter Series and the 43 boat Blackwater Icicle fleet with Howie third in Glenn's boat and me fifth. Winning handicap series wins people over to us, so well done and keep it up. Paul Barnett has also been busy stirring up people and getting them prepped for the new season up on the Tay (see enclosed newsletter). Great job. If you are looking for set-up tips on a new boat, or unhappy with what you have, there is a rig tuning guide on the About Kestrels page (done by Tim Rush, I believe), and if you are thinking of pushing the boundaries, the class rules are on there as well! What is especially nice are the video clips running on the home page, they really show what a great boat it is. Planing breeze, sunshine, competition, what more could you ask for? I have looked at Lake Saratoga from Google Earth before, but when you see it on a video clip you realise that it is a big stretch of water - bet you get a nasty chop in there when it's windy. As of today, on site in the main compound for campervans/motorhomes there are still 9 serviced and 8 unserviced pitches and quayside 8 camping pitches still available. The Centre have indicated that there may well be further land available next to site for camping, that they can open up if it is required, so if the regular pitches have gone when you come to book, get in contact with the Centre, or me. There is also a major campsite a short walk up the beach, so we should have no problems getting accommodation. These will go on the website when confirmed. Looking forward to the end of winter and that spring sailing! Kestrels finished first and second in the well supported fast handicap fleet after two close races. Paul Barnett and Robin Lamb took first place by half a point (it is a long story but a dead-heat on handicap trumps first place in the last race). Great fun and more to come in 2019 I hope. As of this morning, there were 13 serviced pitches left, 5 unserviced and 8 unserviced quayside pitches during Nationals week. So if you are coming to the event it will be worth booking as these are right next to the dinghy park and Centre. The dates are Sunday 11th to Friday 16th August. We will be sharing with the Miracles and Signets. Cost is likely to be either £155 or £165 per boat, including a dinner for helm and crew. The higher cost includes the provision of quad bikes to help tow boats up the sandy beach. After struggling through those stones at Thorpe Bay, that is looking a nice option! If you haven't been to Pwhelli before (the Nationals were last there in 2008), it is a cracking venue, great sailing, no real tide to worry about on the course, and at some point we are likely to get a proper swell into the sailing area, which means great surfing on the reaches! Since 2008 there has been a lot of investment, including a purpose built clubhouse, right by where you exit the dinghy park for the beach, plus limited serviced motorhome spaces and some camping spots on site. If you are looking to book a space, a link to online booking is on the website, but that function isn't actually working for 2019 as of this email - it should be up in the next day or so, according to the Centre. Anyway, with three (albeit smallish) fleets going, you will need to get in early if you want one of these. There is also a full campsite a short distance along the beach, so there should be space for all. Looking forward to it, and seeing as many as possible of you there.